« Are we ready for the paper computer? This outburst from the red giant star V838 Monocerotis – captured by the Hubble Space Telescope in 2002 – is an example of a ‘luminous red nova’. New research shows that such phenomena may be the result of common envelope events (CEEs) in which material tranfers unstably from one star to another. Photo credit: NASA/ESA and H.E. Bond (Space Telescope Science Institute), public domain. If a star began to eat another star, what would it look like? Natasha Ivanova can tell you better than almost anyone; as the Canada Research Chair in Astronomy and Astrophysics at the University of Alberta, pondering questions like this is her full-time job. Last week, Ivanova and her colleagues published a paper in Science which showed that a certain type of stellar cannibalism previously thought to be invisible can be observed from Earth after all. The finding may explain the existence of the recently-discovered phenomena known as luminous red novae. Stars are more gregarious that you may realize. Although our beloved sun is typical in size for so-called main sequence stars, it’s somewhat unusual in that it doesn’t have a close companion. “At least half of stars like our sun are in binary systems,” says Ivanova. “For more massive stars, the probability is higher. Stars 20 solar masses and higher are almost all in binaries.” In binary systems two stars orbit their common centre of mass, but over time this orbit can degrade and the stars can move closer together. Moreover, when a main sequence star gets low on fuel it rapidly expands its radius and turns into a red giant, decreasing the distance between it and its neighbour even more. If they get too close, the smaller, denser star (often a white dwarf) can start to steal material from the larger, less dense red giant. As the material (mostly hydrogen) accretes around the smaller star, it is compressed by gravity and eventually explodes into nuclear fusion. The temporary burst of light created from such an event looks like a new star in the sky, and is therefore called a nova (from the Latin for ‘new’). 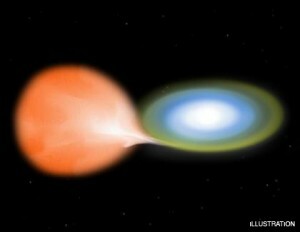 In close binary systems, white dwarfs can cannibalize nearby red giants. When the stellar material gets compressed by the white dwarf’s gravity, in undergoes nuclear fusion and gives of a burst of light known as a nova. Photo credit: (Illustration) NASA/Chandra X-ray Obervatory/M.Weiss, public domain. The idea of CEEs was proposed decades ago, and there are all kinds of exotic binary systems with thrilling names – X-ray binaries, cataclysmic variables, close double neutron stars – that are thought to be formed by them. But until now, nobody ever thought they’d be able to actually observe a CEE, for two reasons. Firstly, they’re relatively quick, lasting perhaps as little as a couple of months. Secondly, it was thought that CEEs wouldn’t look much brighter than a regular red giant; you might stare right at one and not even notice. Ivanova and her team upended that theory by considering something called recombination energy. “In stars, the material is usually ionized; the electrons and protons are separated,” says Ivanova. “When they recombine, energy is released in the form of a very energetic photon.” The phenomenon is not unlike that which makes light-emitting diodes (LEDs) work here on Earth. Ivanova and her colleagues worked out that the recombination energy from a CEE would in fact be bright enough to be seen from Earth, most likely in the red part of the spectrum. 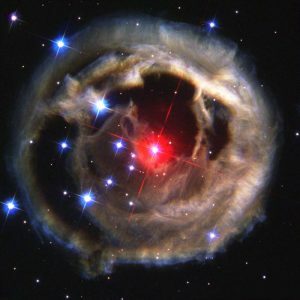 Hunting for luminous red novae/CEEs could help astronomers learn more about the evolution of the exotic binary systems they give rise to. It could even help with the search for ones we could never observe directly, such as double black holes. So far, only a couple of dozen luminous red novae have been found, mostly by sheer luck. “I think now that people know what to look for, we’ll find lots more,” says Ivanova. Fascinating article Tyler. As a longtime follower of the layman’s astronomer, Carl Sagan, I am very impressed with your ability to put something as esoteric as CEE’s into terms I could actually understand. I am also astounded that such a massive “happening” could actually occur in a period as short as a couple of months. Keep these coming Tyler. Thanks Dale. I’m not normally much of a space guy (I prefer chemistry and biology) so this piece required a lot of learning for me too. I can’t wait until the weather gets nicer so I can dust off the ol’ telescope and try to spot some CEEs for myself! I heard an interesting interview on the radio today (CBC I believe) about some research done on pollinators recently (bees, and others). Thought you might find this to be an interesting subject for some future posting. It sure sounds like something of which we all should become more aware. Maybe it’s a just my flower child background from the 60s but sure sounded like we need a lot more flower power in our agricultural thinking, even if just in backyard home gardening. Thanks Dale, I wanted to do something on this but have been just too busy with work. I hope to get back to the blog soon!